Our broody journey this year started with a Derbyshire redcap hen (green right, yellow left or yellow right leg band – we didn’t note it down). We cleared up the shed and popped her in one of the tiny triangle hutches as we hadn’t finished doing the maintenance on the broody coops over winter yet. We decided to provide her with some of our own eggs. A few cream legbar, cuckoo maran and white leghorn eggs with our Heinz 57 cockerel, Aramis, being the father. Despite Brienne being a big chicken and a regular layer of large eggs I’ve decided we won’t be hatching from her again. Her eggs have the occassional wrinkle in the shell but her daughter, Cersi, has awful wrinkles and can be quite thin shelled too. No-one else in the flock is affected so I am assuming it is genetic. I painted up one of the broody coops (with Chi’s help of course) and gave it a good clean. We also put a panel over some of the mesh to keep it a bit drier and warmer. 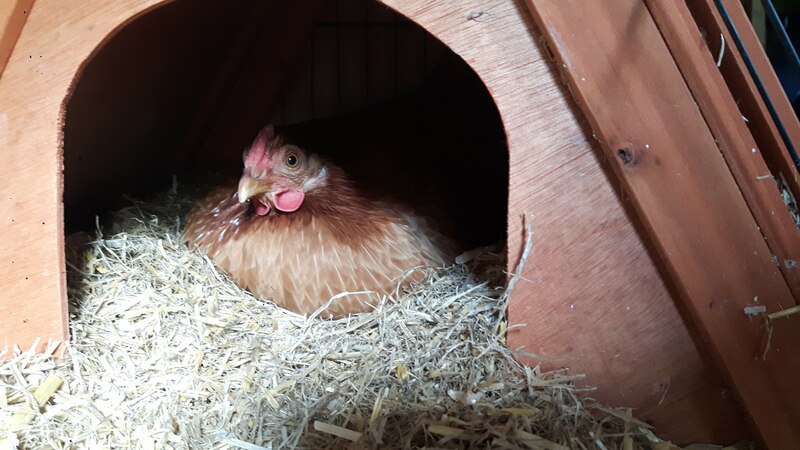 We had wanted to do some work on the roof, there’s a slightly rotten corner and it needs refelting, but we really needed to get the broody into better accommodation. We set her up in the orchard with a run attached to the coop. We ummed and ahhhed but a few days later we put some more eggs into the incubator. She had 7 eggs under her but we wanted to try and get the most for the work we will put in to raising the chicks so the plan was to sneak her a few extra chicks after hatching for her to raise for us. These chicks were set to be meat birds first and foremost, although if we got some more green or dark brown egg layers they could be added to the flock. Everything was looking dandy. Then it seemed like Aurora, our veteran broody Daisy, had gone broody. We would only see her for an hour in the morning each day and she wasn’t returning to the coop at night. We caught her and gave her some random eggs that she seemed to be sitting on. At the same time Christie, another Derbyshire Redcap, had gone broody. We rushed to get the other two small houses ready, ordered some pure eggs off ebay (Copper black Maran and Cream Legbar) and set up a broody nursery in the orchard. The eggs arrived and we did a bit of juggling. The first broody hen and her soon to hatch eggs went into the woodland coop, Christie replaced her in the green coop and Aurora went into the blue coop as it doesn’t have a run and we had pretty good faith in her. The next morning Aurora was gone and showing no signs of being broody at all. No problem, a couple of her eggs went under Christie (we had split them 50/50 3 browns and 3 blues each) and the rest went in the incubator. We had seen a couple of cracks on the Cream Legbar eggs when I candled them on arrival. One started weeping a lot on the first day in the incubator and I discarded it. Having two batches of eggs in the incubator due to hatch at different times isn’t great but it was manageable with the numbers. Then the worst happened. The first broody was off the nest and pacing in her pen. I’d noticed her off twice the previous day but I was in and out so assumed she had gone back in. Checked on the eggs and they were stone cold. 5 days from the hatch date. We couldn’t physically fit them in our 9 egg incubator with the others (7 already in there). I did manage to get 3 more in with a bit of jiggling. The aim was to warm them up enough to see if they were still alive, I had to do it in batches though. I didn’t hold out much hope as they may well have been cold for 48 hours by now. 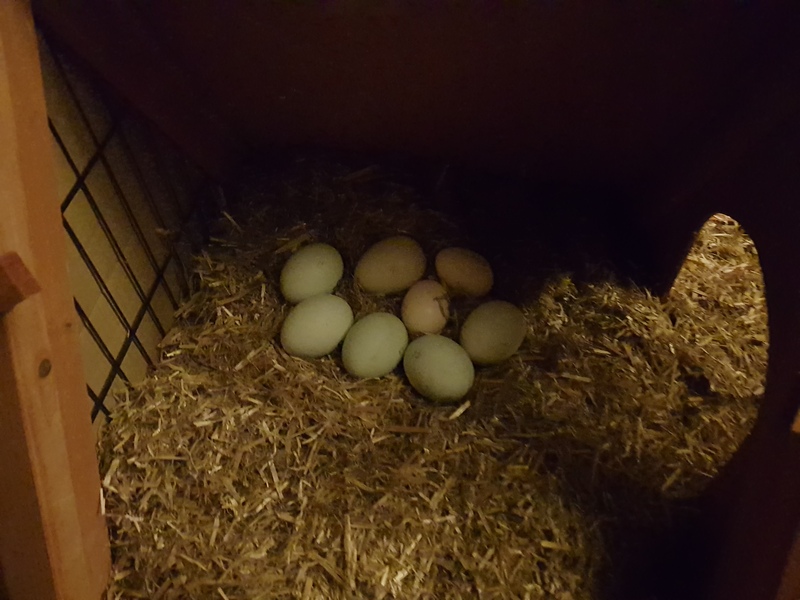 A post on a smallholding group had a local smallholder offering to pop them under her broody hen if we needed which gave me some breathing space. We had also been talking about getting a bigger incubator and this, plus the faff of turning eggs daily, pushed that up our priority list. We ended up buying the incubator anyway as it should allow us to follow our original plan of adding eggs to a hatch whilst still having the 9 egg incubator as a ‘rescue’ one. In the end only 1 of the eggs was still viable, a Cream Legbar one. 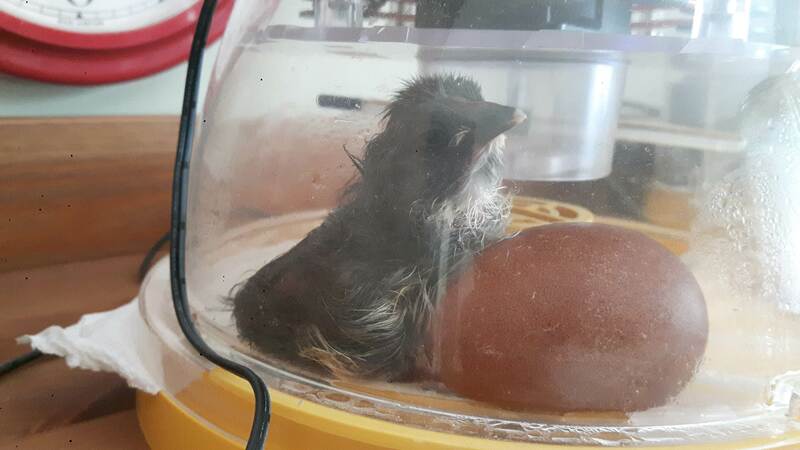 It took a couple extra days to hatch but did so, followed a day or so later by the 4 we had started in the incubator. We ended up with a hatch of 5, 2 Cream Legbar crosses, 1 Cuckoo Maran cross and 2 White Leghorn crosses. Christie was looking a bit pale in the comb so once the chicks had fluffed up we took away the postal eggs she had been sat on and gave her the day old chicks. To start with she didn’t seem too keen to get up and about with them but then we realised she still had a Maran egg under her, once that was taken away she was up and about and has proved to be a great mum. The postal eggs went into the incubator and another Derbyshire Redcap hen, Carrie, decided to try her hand (wing?) at being broody. Sam had commented that she was a bit crazy, quite aggressive and she looked at him funny, twisting her head back. I didn’t think much of it. We knew we had eggs in the incubator we could give her but had a couple go rotten already so we wanted to keep them until closer to hatching as with her being a bit crazy we didn’t want to be bothering her lots to candle. She sat on a couple of Daisy eggs. When I checked on her one day I saw what Sam meant about her neck, twisted right round when you opened the coop. It rang an alarm bell so I took the internet, wry neck. Varying thoughts online about it but vitamin deficiency seemed most likely so we started trying to get some baby vits in her. After one dose she was doing really well but we’d had another hen, Chickaletta (not named by us), go broody and I was worried about Carrie so we moved her to the blue coop without a run and left it open in the hopes she would graze a bit more when she got up each day. Chickaletta got some rubber eggs as we weren’t far off hatching the incubator eggs. After the second dose of being pinned and given the vitamins Carrie decided it was all too much and left the nest. She is no longer broody thankfully and the eggs under her hadn’t developed. She is much better now she is foraging but she still isn’t great so she is due to be penned up and given the vitamins everyday for a set time. Fingers crossed. So Christie was happy with her chicks and Chickaletta was sitting, and the postal eggs were doing well in the incubator, although we were down to 5. Then both Brienne (a previous broody) and another Derbyshire Redcap both went broody. I’m running out of housing at this point! We did another shuffle. 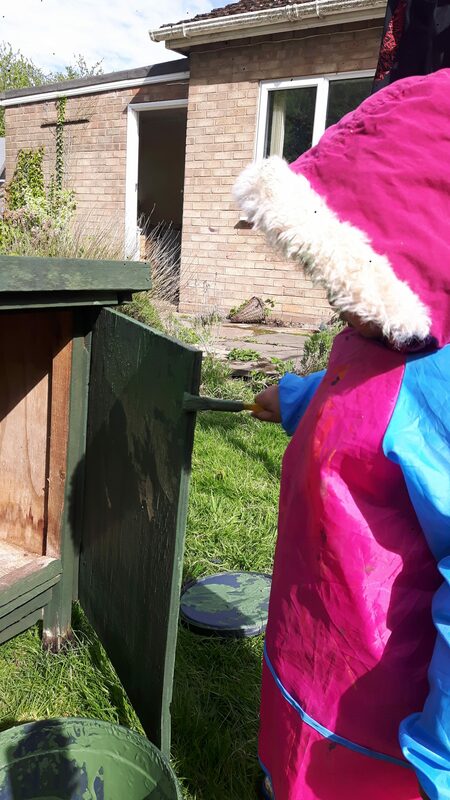 Christie and the chicks went into the blue coop as it doesn’t open from the top and we don’t need to check them much, we gave them back the blue run which had been used with the woodland coop. Chickaletta stayed in the woodland coop with the woodland coop run and Brienne went into the green coop with no run, again she had been a great broody last year so we trusted her. How foolish. 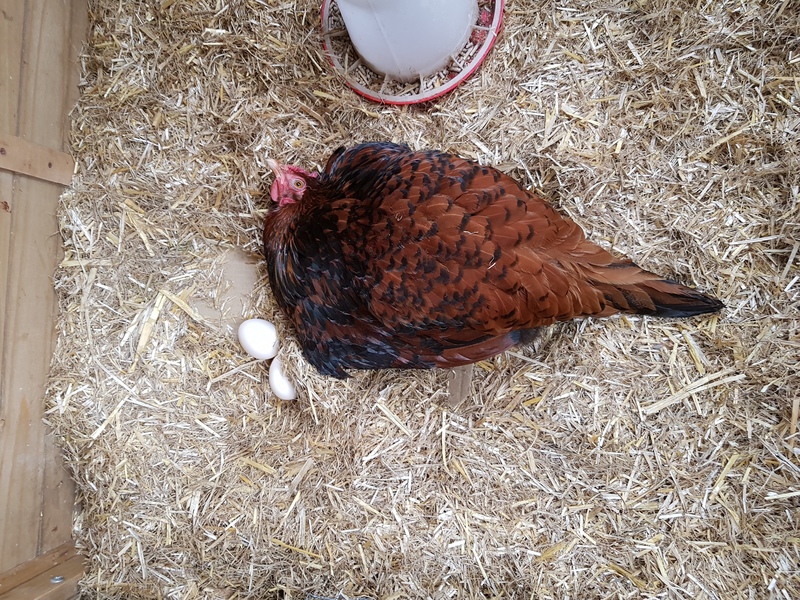 Despite having a nice private suite with a clutch of 9 eggs to sit on she bolted for the chicken house first thing to sit on an empty nest… She did this for two days before we put her food and water inside and locked her in with her eggs. 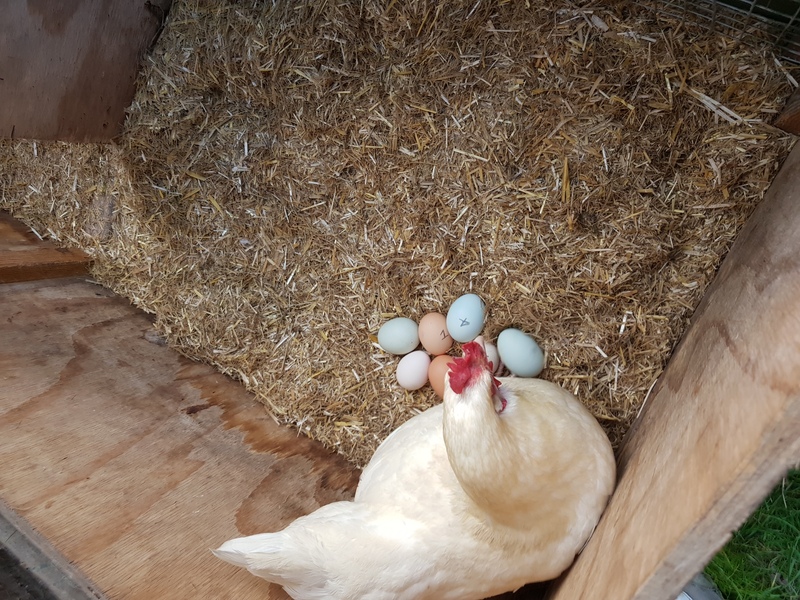 She was still broody but had imprinted on the main hen house. She has the door open today and is still sitting so *fingers crossed* and building a run for the green coop has risen on our priority list. The postal seller has sent us 6 more Cream Legbar eggs to make up for the damage in postage and poor fertilisation rate of the first batch (no development at all on a fair few eggs). 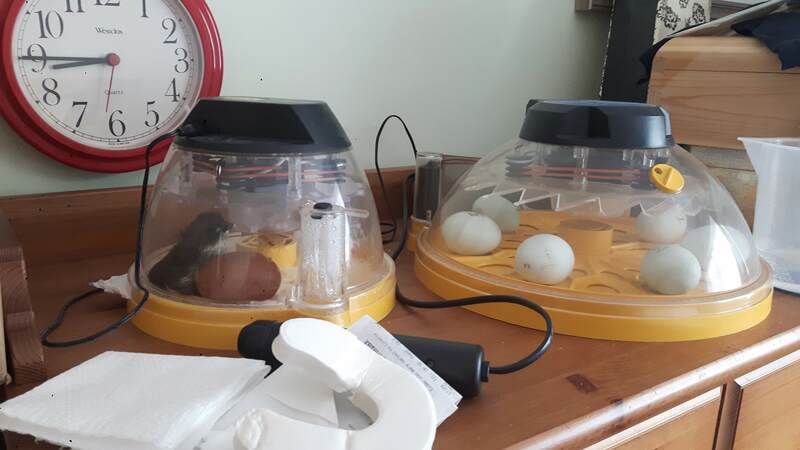 Those went into the shiny new incubator and will be transferred to the new broody DRC as soon as we have a house for her, which Sam is picking up today. It was hatch day for the postal eggs on Tuesday so over the weekend we gave the eggs to Chickaletta to let her hatch them. We noticed the brown eggs pushed out a couple of times and nudged them back under. When they were out again on Tuesday we took them and put them in the small incubator. Wednesday afternoon she had at least one chick under her. Today one of the Marans has hatched in the incubator and the other has pipped, I also peeked at her and she now has two chicks and an unhatched egg. If it is still unhatched this evening (when we will likely give her the hatched chick) I’ll pop it in the incubator. So yes, that is our 2018 broody journey so far. It’s been a bit exhausting to be honest and we still have just under 3 weeks before everyone has hatched as they should, by which time we may well have more broodies! P.S. As always if you like the post, give us a thumbs up. If you want to be notified of every blog post then subscribe – there’s a button to the left or below if you’re on a mobile device. Comments are always welcome too!